Vehicles on North Broad Street. 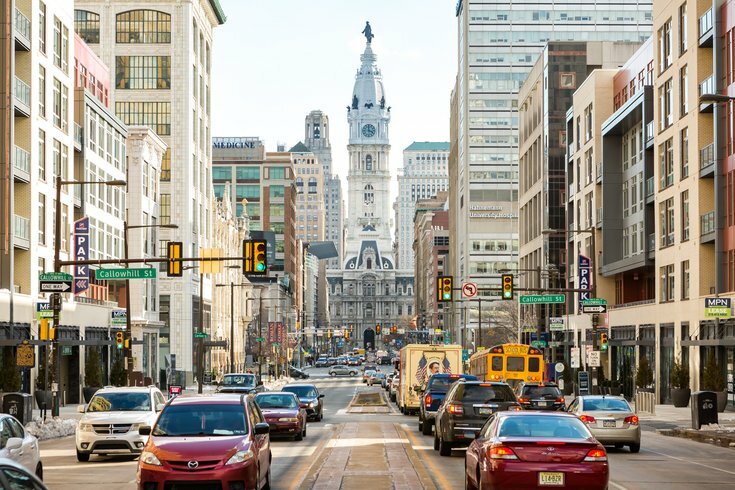 The city of Philadelphia has nearly exhausted its annual overtime spending budget – with three months left in the fiscal year. Overtime spending totaled $135.4 million through the third quarter, which ended March 31, according to preliminary totals released Wednesday by the Pennsylvania Intergovernmenal Cooperation Authority. That equates to 99.8 percent of the $135.6 million budgeted for Fiscal Year 2018. The city's overtime spending threatens to undo efforts made in recent years to reduce overtime costs, according to the PICA report. In Fiscal Year 2017, overtime costs dropped. But the city is on pace to spend more on overtime than it did in either of the past two fiscal years. The city has spent $18.9 million more than it had at this point during the last fiscal year – a 16.2 percent hike. "A variety of factors, such as championship parades, protests, weather events, and staffing vacancies contribute to overtime costs," said Mike Dunn, a spokesman for Mayor Jim Kenney. "The mayor and managing director are unwavering in their commitment to make sure departments closely manage overtime costs in order to stay within their overall personnel budgets." The city previously identified seven departments as candidates to reduce overtime spending. Those seven departments have used up nearly 92 percent of Philly's overtime budget. Four of them – the Free Library and the fire, streets and public property departments – have overspent their overtime budgets by at least 26 percent. The other three departments – police, prisons and parks and recreation – each have used up at least 80 percent of their overtime budgets. These departments face among the biggest overtime challenges, according to the PICA report. Snow removal and irregular trash and recycling collections impacted the streets department, the report noted. And the fire and prisons departments are challenged by a shortage of firefighters, EMS staffers and correctional officers. The Eagles' Super Bowl parade – which cost taxpayers $2.7 million – and similar playoff celebrations likely impacted the police department's overtime spending. Court appearances also affect police overtime. The PICA report recommended the city "find the appropriate balance between staffing levels and overtime usage." "And whereas special events like Super Bowl parades are difficult to predict, PICA staff recommends that the city budget overtime in the future with the increasing frequency of such events in mind," the report stated. The PICA report questions whether city officials have placed less emphasis on overtime spending in recent years. It also noted that Kenney's first five-year financial plan "clearly quantified spending reduction goals" and requested departments submit quarterly overtime spending plans. Those plans were later forwarded to PICA. But PICA has not receiving any quarterly reports from the previous year and Kenney's latest five-year plan did not mention any initiatives aimed at reducing overtime spending. PICA recommended the city renew efforts to curb overtime costs. "It appears that city departments' success in reducing overtime spending is at least indirectly linked to the emphasis placed on such initiatives by the administration in its five year plans," the PICA report stated.